Eat mac & cheese with your fingers! 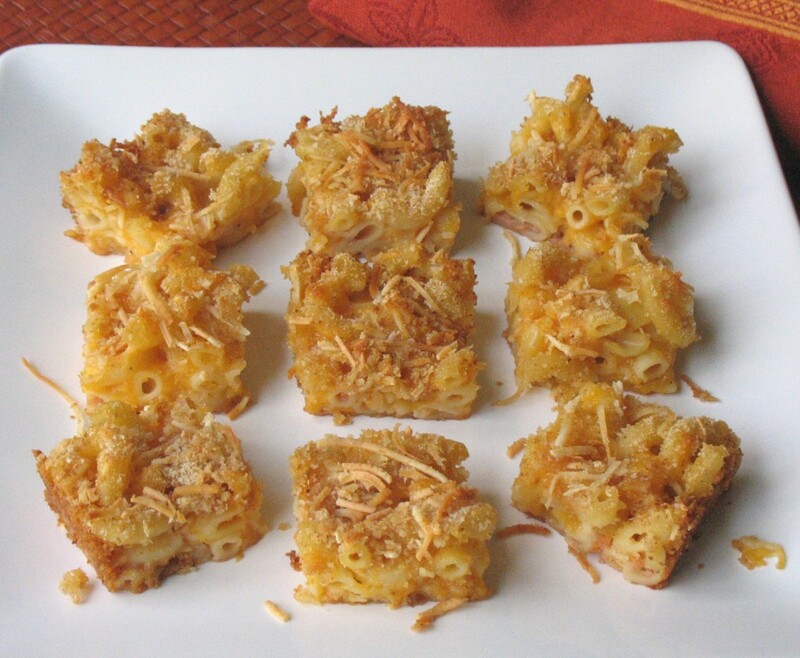 Macaroni and cheese as finger food? Absolutely. This is not your routine mac & cheese by any means because you pop it in your mouth by hand. But what really sets this apart is a splash of Angostura bitters that elevates the flavor to munchies you can’t resist. It’s a perfect palate pleaser for adults and kids alike, and ideal for all the autumn tv watching (presidential debates, football, SF Giants in the World Series, new tv shows etc etc). So try this delectable snack. You’ll love them. Promise. Conveniently, my Mac & Cheese Bites can be made a day or two ahead. Remove squares from pan and refrigerate. To reheat, place squares on a sheet tray or toaster-oven tray; heat at 350°F for 5 minutes or just until warm. Or place squares on a serving plate and microwave, uncovered, on medium power 45 seconds or until warm. 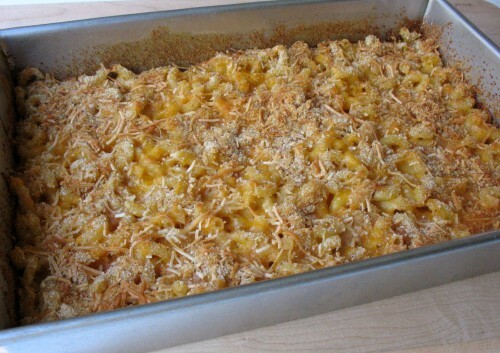 Prepare macaroni ahead of time, cooking 1-2 minutes less than the time on the box. Drain and rinse well. If cooking a day ahead, cover and refrigerate. Macaroni should not be wet when starting this recipe. Preheat oven to 350°F. 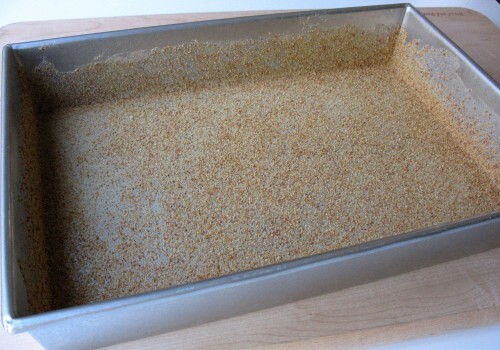 Liberally butter the bottom and sides of a 13×9” baking pan. Sprinkle with about 3 tablespoons of the bread crumbs; shake pan to coat bottom and sides. See photos below. Place remaining bread crumbs (1/3 cup or so) in a small bowl and stir in 1/2 cup of the Romano cheese; set aside. Measure milk. Add Angostura bitters, salt, pepper and nutmeg; stir to dissolve salt. Place macaroni in a large bowl. Stir in milk mixture. Stir in the Cheddar cheese and remaining 1/2 cup Romano cheese. Let rest 5 minutes; stir again. Spoon into prepared baking pan and spread out evenly. 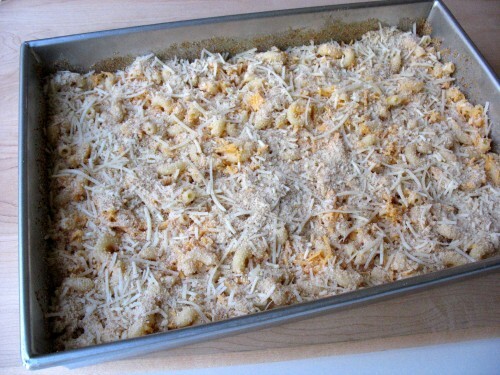 Sprinkle the bread crumb/cheese mixture over macaroni. Bake uncovered 35-45 minutes until edges are browned. Let cool 20 minutes. Use a sharp knife to cut 35 squares (7 rows x 5 rows). Remove from pan with a metal spatula. Serve warm. – Different brands of elbow macaroni yield different amounts of cooked pasta, from 5 to 6 cups for 8 oz uncooked elbows. It’s best to cook more then needed, and use any remaining elbows for salads or side dishes. – Cheeses vary widely. Choose a robust, tangy Cheddar and perhaps Pecorino Romano for the fullest flavor. Baked, cooled 20 minutes, ready to cut. Tasty Comfort Food, snackable and crunchy. With your recommendation as a World Series popper, I was disappointed that there were no beverage suggestions. Most likely would be a light lager, but how about something that would play well with the Angostura bitters? An English (Yorkshire) Bitters, or something a little malty like an Anchor Brewing Brekle’s Brown Ale? Humm… beer. I know these go great with my everyday beer, Moosehead. I will make these for my usual super bowl party! Greg, you’re waiting til January to make these? How about the World Series? Go SF Giants! OK Ms. Susan. If you make these, you have to let us know your thoughts. Likes, dislikes etc! I’m not a foodie & don’t have a clue what angostura bitters are or where to get them. I want to make these for my daughter’s lunch. She is a big mac & cheese fan. Thanks! Francine, you don’t have to be a foodie to know what Angostura bitters is. It’s been widely used in beverages for almost 200 years. If you’ve ever had a Manhattan cocktail or Pisco sour, you’ve had Angostura bitters. Read more at http://getcookingsimply.com/bitters-with-ice-cream/ where you can also see what the bottle looks like. It’s available in the liquor section of well-stocked grocery stores, and in liquor stores. I look forward to hearing if you daughter likes my mac & cheese bites! These sound fabulous! Alison, whose entire sustenance depends upon Mac ‘n cheese , will go ga-ga over these. And it’s something she can make herself. Can’t wait to try them! Trish, when Alison makes these you have to let me know if she likes her mac & cheese in bites – and with bitters. In addition to the bittersw, the types of cheese makes a big difference. Rita – I’ve learned so much about bitters from you. You’ve made me a believer in taking recipes from ordinary to extraordinary with just a drop or two of bitters magic!